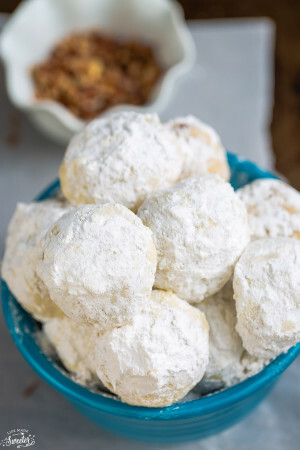 Nutella Stuffed Snowball Cookies are the perfect addtion for your holiday cookie platter. 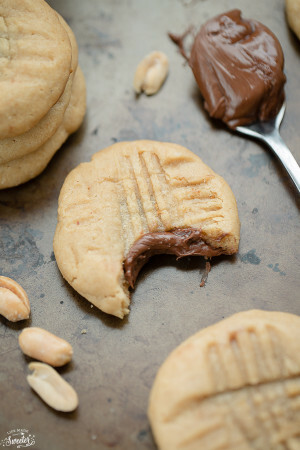 Best of all, these classic melt in your mouth shortbread cookies are so easy to make with a surprise Nutella filling inside. 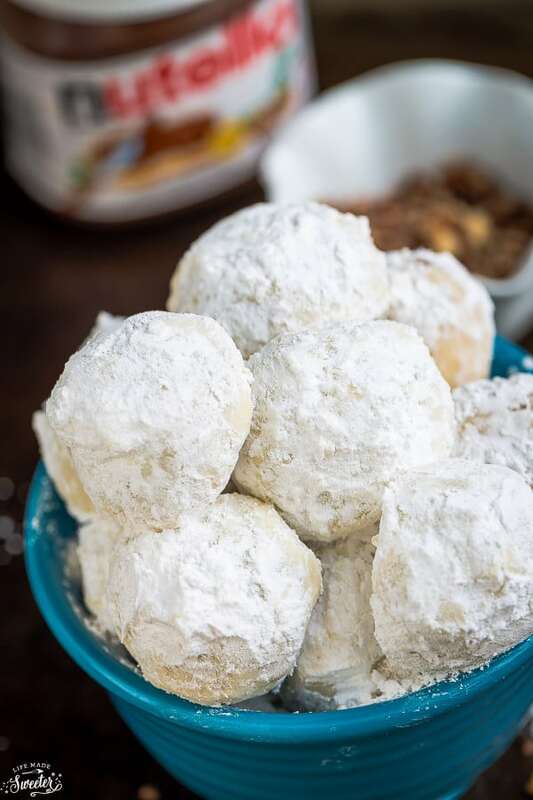 Snowballs, Russian Tea Cakes, Mexican Wedding Cookies, Butterballs – they have so many names but whatever you call these cookies, they always remind me of Christmas and are a must for any cookie platter. 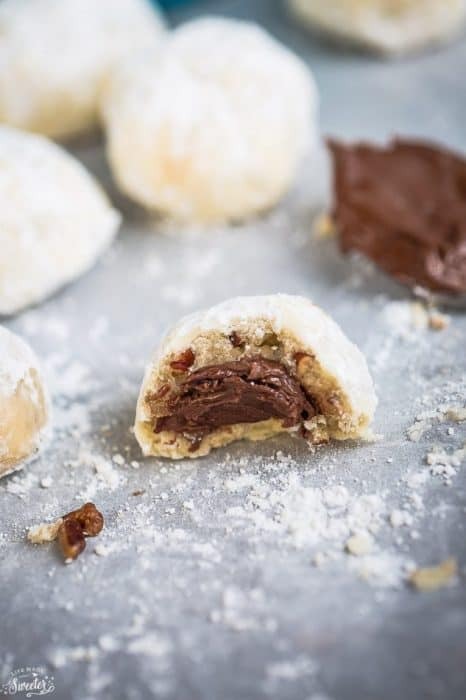 Over the weekend, we were packaging up the rest of the fudge and cookies to give away along with these Nutella Stuffed Snowball Cookies a few years ago. So I decided to update the pictures and repost them again in case you guys are looking for a different cookie recipe. 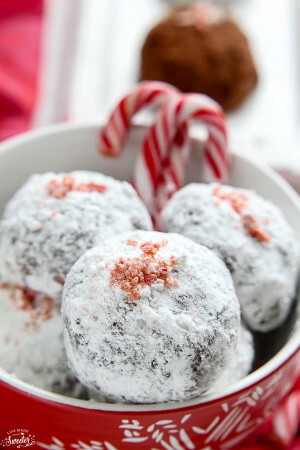 They are one of our favorite cookies that we make every year along with these peppermint stuffed snowballs and make the best homemade gifts! 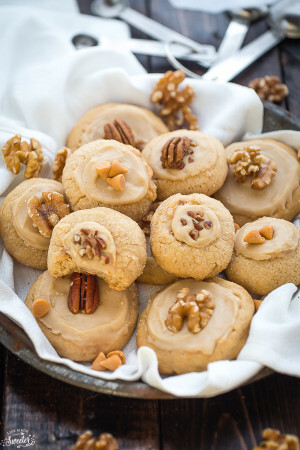 They start off with a buttery shortbread like dough and you can choose to add finely chopped pecans, walnuts or hazelnuts. Once the dough is done, you can either bake it right away or wrap it up to chill in the fridge for about half an hour. I usually chill the dough because I find it helps make the dough easier to handle and the cookies are more likely to stay round. After they are baked, they get rolled into a pillow of powdered sugar and get transformed into the most poppable and addictive cookie. They are perfect for any holiday cookie exchange and we can’t seem to get enough of the surprise Nutella filling! A twist on these holiday classic snowy shortbread-style cookies with a surprise Nutella filling inside. Line a baking sheet with parchment paper or a silicone mat. Scoop sixteen 1/3 - 1/2 teaspoon sized balls of Nutella and place them on the baking sheet. Place baking sheet in freezer for 30 minutes. Meanwhile, line another baking sheet with parchment paper or a silicone mat. Set aside. 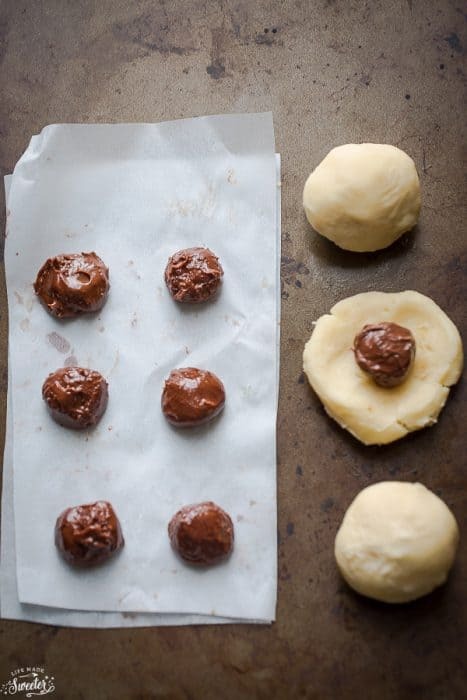 Add another ONE tablespoon of cookie dough on top and press the sides together and wrap dough around and roll into balls. Place on prepared cookie sheet. Repeat until all the dough is used up. Chill entire baking sheet in the fridge for at least 30 minutes. Bake cookies for 14-15 minutes until bottoms are just slightly brown - rotating pans halfway through. Be careful not to over-bake. Meanwhile, sift 1/3 cup icing sugar into a medium bowl. While cookies are still warm, roll them in icing sugar. Place cookies on cooling rack, once they have cooled completely, roll them in icing sugar again. The amount of cookies you end up with will depend on the size that you roll your Snowball Cookies.